Gas exchange is a biological process through which different gases are transferred in opposite directions across a specialized respiratory surface. Gases are constantly required by, and produced as a by-product of, cellular and metabolic reactions, so an efficient system for their exchange is extremely important. 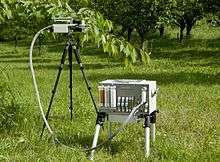 It is linked with respiration in animals, and both respiration and photosynthesis in plants. 2 is released. The exchange of gases essentially occurs as a result of diffusion down a concentration gradient: gas molecules moving from an area of high concentration to low concentration. Diffusion follows Fick’s Law. It is a passive process (no energy is required) affected by factors such as the surface area available, the distance the gas molecules must diffuse across and the concentration gradient. Gases must first dissolve in a liquid in order to diffuse across a membrane, so all gas exchange systems require a moist environment. In single-celled organisms, diffusion can occur straight across the cell membrane; as organisms increase in size, so does the distance gases must travel across. (Their surface area-to-volume ratio also decreases.) Diffusion alone is not efficient enough and specialized respiratory systems are required. This is the case with humans and with fish that have evolved circulatory systems: these are able to transport the gases to and from the respiratory surface and maintain a continuous concentration gradient. Gas exchange in humans. 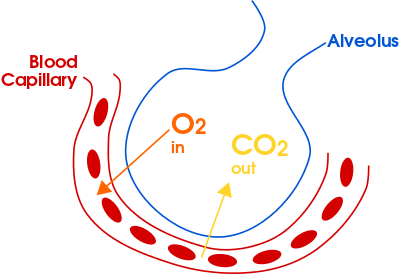 Oxygen and carbon dioxide diffuse between a capillary and an alveolus. 3). This reaction is catalyzed by the carbonic anhydrase enzyme in red blood cells. The main respiratory surface in humans is the alveoli, which are small air sacs branching off from the bronchioles in the lungs. They are one cell thick and provide a moist and extremely large surface area for gas exchange to occur. Capillaries carrying deoxygenated blood from the pulmonary artery run across the alveoli. They are also extremely thin, so the total distance gases must diffuse across is only around 2 cells thick. An adult male has about 300 million alveoli, each ranging in diameter from 75 to 300 µm. 2 can then be exhaled out of the body. Continuous blood flow in the capillaries and constant breathing maintain a steep concentration gradient. During physical exercise, excess carbon dioxide is produced as a result of increased respiration, and muscles and cells require increased oxygen. The body responds to this change by increasing the breathing rate, maximizing the rate of possible gas exchange. 2 without losing too much water. 2 concentration, which reveal important information about the photosynthetic condition of the plants. Oxygen, essential for respiration during the night, plays a minor role in plants' gas exchange as it is always present in sufficient amounts. Fish must extract oxygen dissolved in water, not air, which has led to the evolution of gills and opercula. Gills are specialized organs containing filaments and lamellae: the lamellae contain capillaries and provide a large surface area and short diffusion distance, as they are extremely thin. Insects such as crickets do not have an inner skeleton, so they exchange gases across structures known as trachea and tracheoles: tubes that run directly into the insect's body. Air enters the trachea through spiracles and diffuses into the respiring tissues. Amphibians are able to use their skin as a respiratory surface. They also have lungs and sometimes gills can be used. 1 2 "Gas exchange". Retrieved 19 March 2013. ↑ Kety SS (1951). "The theory and applications of the exchange of inert gas at the lungs and tissues". Pharmacological Reviews. 3: 1–41. ↑ "Gas Exchange in humans". Retrieved 19 March 2013. ↑ K. Raschke (1976). "How Stomata Resolve the Dilemma of Opposing Priorities". Phil. Trans. R. Soc. Lond. B. 273: 551–560. ↑ S Von Caemmerer; GD Farquhar (1981). "Some relationships between the biochemistry of photosynthesis and gas exchange of leaves". Planta. 153: 376–387. ↑ Newstead James D (1967). "Fine structure of the respiratory lamellae of teleostean gills". Cell and Tissue Research. 79: 396–428. doi:10.1007/bf00335484. ↑ Hughes GM (1972). "Morphometrics of fish gills". Respiration physiology. 14: 1–25. doi:10.1016/0034-5687(72)90014-x. ↑ "Gas Exchange in Insects". Retrieved 19 March 2013.